The great floods that affected a number of regions in recent years have attracted a great deal of attention throughout the world. When looking at our Polish experience, it is obvious that flooding is responsible for a great number of damaging events than most other types of natural disasters. Therefore, intensification of the studies of various aspects of flood problems is a must and is challenging not only for a scientific community but also for decision makers at both local and state levels. 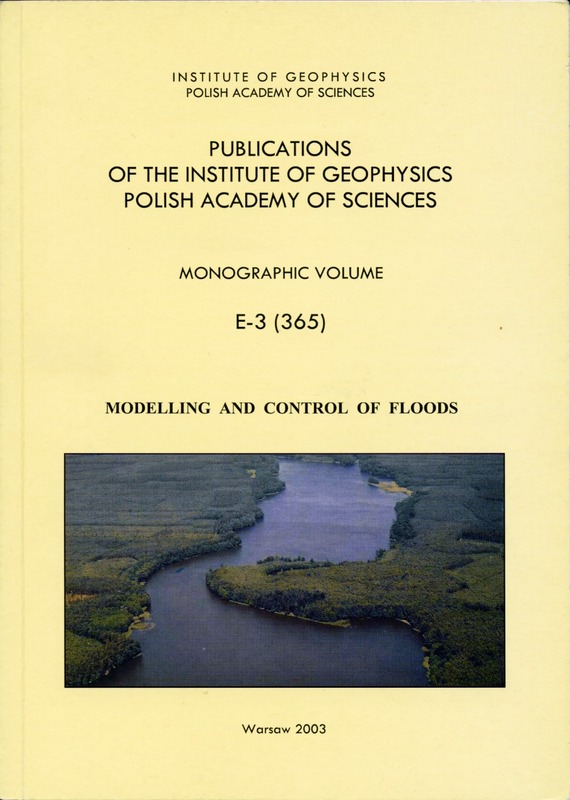 Author(s): Napiórkowski J., Rowiński P.
The present study is the author's personal view on the current trends and needs in the modelling of flood related problems and flood control, numerical weather prediction, rainfall-runoff simulations and fluid motion in rivers. A survey of various approaches to describe floods in terms of mathematics and basic elements allowing to evaluate the performance of a model are given. The models are thought as basic tools for both pre-flood activities and operational flood management. Special attention is paid to flood routing models in which various simplifications and extensions of the Saint Venant equations of motion, as well as two-dimensional shallow water equations are commonly applied. The erosion, sedimentation and transport of plant nutrients, pesticides and pollutants are closely associated with the rainfall-runoff process, and therefore mass transport models are also considered. An important part of the paper constitutes the discussion of the main objectives and control mechanism of flood control systems. Author(s): Liszewska M., Jakubiak B. A statistical postprocessing procedure in order to downscale and improve numerical forecasts of rainfall for the purposes of Decision Support System for Flood Control has been developed. The method combines principal component analysis, canonical correlation analysis and regression. Experiments are concentrated on the Nysa Kłodzka catchment. The computations have been performed using precipitation data from the 1997-2000 period, and focused on the 1997 flood cases which especially affected the region. In some cases, an improvement of statistically corrected predictions over direct use of numerical forecasts has been achieved. This paper describes an application of PrePro model preprocessor and HEC-HMS hydrological model to the Nysa Kłodzka catchment. Simulated series of 1997, 1977b and 1965 flood events showed good agreement with observed data. An analysis of values of calibrated parameters for subcatchments showed convergence of parameters estimated for different flood periods. This is very promising for application of this model in ungauged catchents. The paper presents a description and results of calibration and verification of a model elaborated to predict total flood flow in the catchment of the Nysa Kłodzka River. Two versions of the model operate with the temporal resolution of 3 hours or one day. Hydrographs from the flood in 1997 recorded at the profile Bardo and at the inflow to Otmuchów reservoir were used to calibrate the model. Precipitation and effective evaporation calculated in a simplified manner were the inputs to the model. The model is conceptual and hydrological processes are described with the state and output equations. Water retention in the catchment area, formation of the direct outflow including the phenomenon of active areas, direct feeding of streams with the rainfall, ground water outflow and flow transformation in the river channels were all considered. The obtained accuracy of simulated hydrographs, confirmed by results of verification with independent data (Nash-Sutcliff's efficiency coefficient between 85.0% and 97.1%) permits to apply the model for practical forecasting of rainfall floods. Author(s): Szymkiewicz R., Weinerowska K.
In the paper, typical forms of Muskingum model and their modifications are presented. In the traditional forms of linear Muskingum and Muskingum-Cunge models it is impossible to consider the variable wave celerity, as the model parameters are constant. Such a situation often leads to unsatisfactory results. The attempts to consider variable parameters in the Muskingum equation pointed out that in such a case the obtained results suffer from considerable mass balance error, which can be up to 10%. Additionally, the obtained outflow hydrograms may suffer from non-physical oscillations. From the practical point of view it is purposeful to apply in the flood control algorithm such flow routing models which enable to obtain the result in a reasonably short time; thus, it is purposeful to develop such modifications of Muskingum model, which improve the results. The nonlinear conservative form of the Muskingum model is presented and the results compared with other variants. The tests confirmed the advantages of the presented approach. The flood control problem is discussed in respect to the Nysa Kłodzka Reservoir System. The main goal of the paper is to present the performance of control mechanisms developed by the authors to minimize the maximum peak of the superposition of waves on Nysa Kłodzka and Odra Rivers. The control structure consists of the simple tank models to describe the reservoirs performance, the St. Venant equations to represent transformation of flow in open channels and the sequential optimisation algorithm. This algorithm makes use of characteristic features of the system and global optimisation methods. Relations resulting from the system dynamic equations enable to separate calculations for any particular reservoir in the cascade and to propagate the results to other system components so that computational costs grow linearly with the number of reservoirs. The encouraging results of test for both synthetic and historical data are presented. A summary of experience with development of methods for controlling multiple reservoir systems during flood period, gained through computer simulation is presented. The control systems based on on-line forecasting and optimization are taken into consideration. Particular attention is focused on a hierarchical control structure with periodic coordination. Profits of developing sophisticated control structures and decision mechanisms with respect to available quality of inflow forecasting and delays involved by data transmission and computation time are considered. The results of simulations of an on-line reservoir management in the case study of the upper Vistula and Dunajec river-basin systems located in the southern part of Poland are described and discussed. The main objective is to point the role of computer simulation in the development of control mechanisms for large scale environmental systems.